We are delighted to have FIRE and SOLE participating in the DublinTown Food and Drink Festival, where city centre’s restaurants, bars, cafés, bistros and hotels to make a programme of events that highlight the city’s amazing food and drink offerings from the 15th October to the 21st October 2018. A well-prepared steak is one of life’s great pleasures! For the first time ever FIRE Restaurant and Lounge are offering guests the chance to learn how to cook the perfect steak and learn expert tips from FIRE’s chef. Guests will enjoy the steak they have cooked with a selection of sides but not before learning to pour the perfect pint of FIRE 1864, FIRE’s very own craft beer, to accompany their perfectly cooked steak. Why dine in only one restaurant when you can dine at two? Enjoy the best of Irish oysters and beef with this combination ticket. Your evening will begin at SOLE Seafood & Grill on South William Street, where you will enjoy a selection of Irish Oysters while learning the difference between the rock and native oysters from around Ireland’s coast. You will then head to FIRE Restaurant and Lounge on Dawson Street, where you will enjoy a 10oz Dexter Sirloin, an exclusive cut of beef for the Food and Drink festival, expertly cooked to your liking and a selection of sides. Of course, what would a meal be without a delicious dessert? To finish you can enjoy your choice of dessert from FIRE Restaurant. SOLE invites you to join them for a celebration of Irish Oysters and the return of the Native Oyster to their menu. 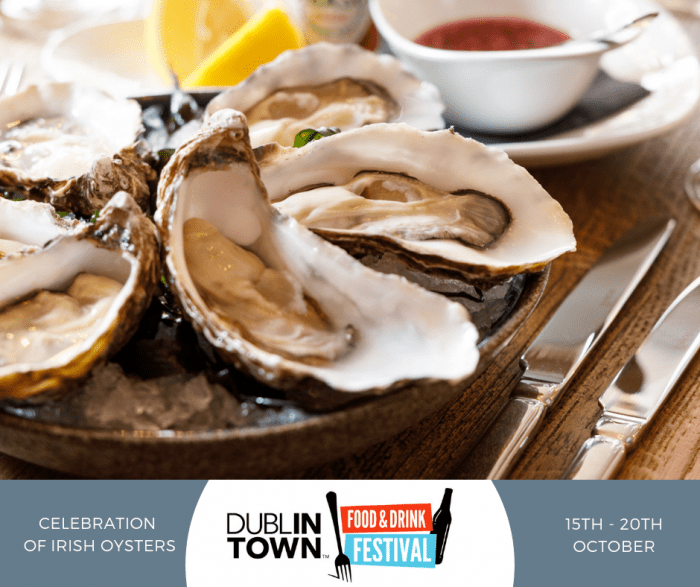 From Monday 15th – Saturday 20th October there will be an outdoor ice bed of oysters outside SOLE and SOLEs team will be joined by oyster producers from around Ireland who will be serving their oysters, natural and dressed, whilst chatting to guests throughout the day. The size, shape and flavour of Oysters vary considerably from coast to coast in Ireland so treat your taste buds and join the team at SOLE for a series of tastings, talks and demos throughout the day and discover the difference in taste and what makes each oyster special in its own right. 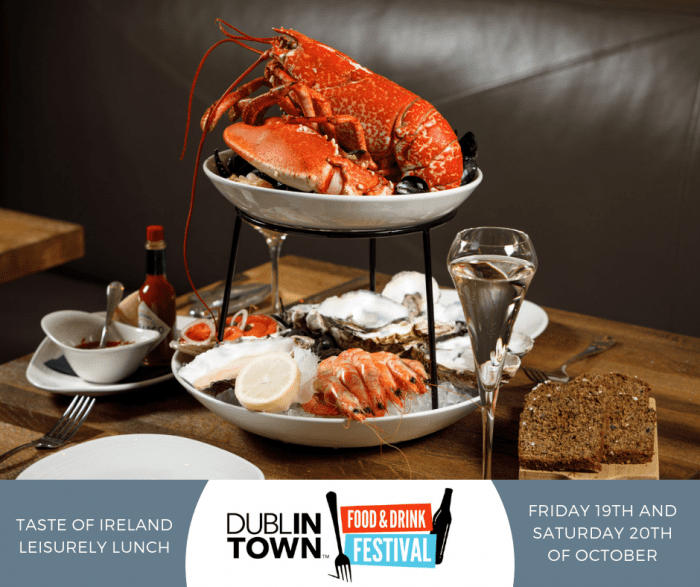 Indulge in the freshest seafood from sea to SOLE during the Dublin Food and Drink Festival. With SOLE’s ‘Taste of Ireland’ seafood tower, you can indulge in the best fresh seafood from around Ireland including Howth smoked Irish Organic Salmon, classic prawn cocktail with Dublin Bay Prawns, a selection of Irish rock and native oysters, pan-roast Irish brown crab claws and Steamed West Cork mussels. All served with freshly baked bread and a glass of Muscadet, the perfect option for a leisurely lunch!